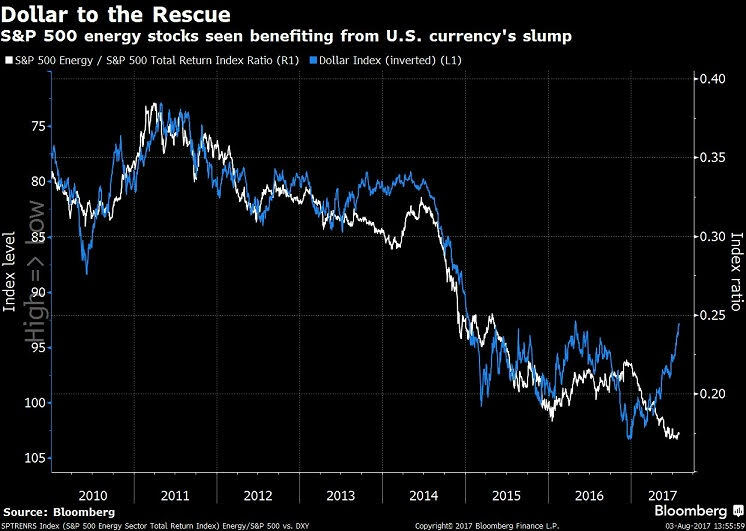 The dollar’s retreat this year may lead to a rebound in U.S. energy stocks, according to Jim Paulsen, Leuthold Group Inc.’s chief investment strategist. Paulsen compared the U.S. Dollar Index, which fell 9.6 percent for the year through Wednesday, with the ratio between the S&P 500 Energy Index and the S&P 500 in a report Monday. The dividend-adjusted ratio dropped last week to its lowest level since January 2004. “Energy stocks could be market leaders again for a period” as long as the dollar declines further, he wrote.